Built like a small village overlooking the Aegean Sea, the 5-star, all-inclusive, Costa Lindia is on Lardos Beach in Rhodes. It features a tennis court, 6 pools with bridges and waterfalls as well as ethnic restaurants. Free Wi-Fi access, a mini bar and a private bathroom with hot tub are included in the air-conditioned rooms. A satellite TV and radio are standard. Balconies offer views to the sea, the pools and gardens. Meals are full buffets with show cooking, available in the main restaurant of the Costa Lindia Beach. Guests can taste ethnic cuisines at the Arabic, Chinese, Greek and Italian restaurants. Drinks and ice creams are provided at the pool bars. Fitness options include a gym and mini soccer facilities. Water skiing lessons and jet skis are provided on the beach. Younger guests can have fun at the water slides or at the mini club. The village of Lardos is at 1.5 km and historical Lindos is 6 km away. 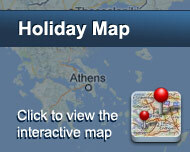 Staff at the 24-hour front desk can arrange car rentals to explore the medieval city of Rhodes 55 km away. Rhodes International Airport is at 60 km. Είστε ιδιοκτήτης ή διευθυντής στο COSTA LINDIA BEACH; Εγγραφείτε τώρα για δωρεάν εργαλεία, που μπορείτε να χρησιμοποιήσετε για να βελτιώσετε την καταχώρησή σας και να συνδέσετε την ιστοσελίδα σας και το σύστημα κρατήσεών σας.